What caused me to blow off the dust? - I found myself humming a track off this cd a few weeks ago and it took me a few minutes to figure out who it was. I stood in front of the cd rack and said it must be this...nope..this...nope....then it came to me. There you have it. 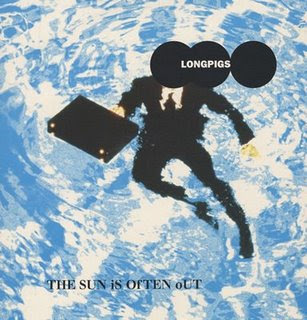 Overview - This is the debut record from Sheffield England's "Longpigs". After almost never making a record the bands contract was purchased by U2's new record label and in 1996 the record saw the light of day. Even with extensive touring behind Radiohead, Echo and the Bunnymen and some decent radio play in the US the band failed to really reach to a wide audience. The band would release a second album, the label would fold, and the band would break up. FDF Comments (aka the songs) - The disc opens with "Lost Myself" a track that opens with light guitar and rolling bass and drums. The guitars get a little more playful and as the chorus comes the vocals get pushed with a lot of strong chords and some start stop progression(s). Hunt goes from gruff to a falsetto voice before running a decent guitar solo. One of the first singles from the band was "She Said" and its easy to hear why. The brit pop feel is right at the outset with the buzzy guitars and piano before Hunt comes in with his urgent vocal. The bass line on the track is swooping and infectious but its Hunts vocals that get the biggest workout on the track. There is a great false ending section where Hunt growls and then hits the chorus before the band wraps up in a chaotic fashion. Another uptempo track is "Far". The guitars rush right up and the overall feel will be a welcome sound to fans of Britpop. The band eases up some on the verses but come the chorus everyone chimes in musically and vocally. The whole band really adds a lot to this track from a vocal standpoint. Another single was the ballad "On And On", a pretty track with acoustic guitars and subtle drumming but Hunt once more gets the show case flashing his strong vocal pipes. Get out your lighters (or cell phones now) its one of those tunes. A solo electric guitar opens up "Happy Again" before Hunt sings with the bass drum going off. The bass comes in and does a lot of long swooping fills before the rest of the band comes in. The hammond really comes out and plays nice with the bass. The guitar at times has a real great crunchy/compressed sound as well at times. "All Hype" is another quiet track with very hushed lead vocals and a single guitar until close to the 45 second mark before the band comes in with some nice harmonies. After about 1:05 the track picks up, but does a loud/quiet shift. We are back to mellow before you know it. "Sally Dances" wastes no time getting to the vocals but musically we are not all that interesting on this track. Its not a bad track, not a throw away track but it doesn't hit you one way or the other. A deep bass opens up "Jesus Christ" and the guitar chugs over the top and leading to the chorus the band gets urgent vocally and musically, really belting it out. We keep with a cool deep bass on "Dozen Wicked Words". The track follows the bass lead here and Hunt again is in fine form. "Elvis" is a quick track, perhaps the quickest vocal delivery as well as the band working overtime. The song even increases in speed as it nears the close. The last track listed on the cd is "Over Our Bodies" a track clocking in at close to 7 minutes, the longest on the record. Hunt begins hushed and the guitars are quiet and the drums use the ride cymbal for some chime. The bass gets pulled up more 3 minutes in and becomes the focus as it does some extensive runs while the guitar is pushed back in the mix, during this time the drums are gone totally before the snare clips everyone back in. At that point, the guitar gets the longer solo, but the vocals are still there, so the solo comes and goes. The whole track has a minute plus slow/long fade. There is a hidden track, its called "Sleep", you need to sit thru (or fast forward) thru 9 minutes of a silent track before reaching it. It begins with a solo guitar and it is conducive to sleep as it is not all that flashy. When the vocals come in they are started falsetto and done that way a few times. Its not that great a song, and if I had to fast forward an actual tape I am not sure I'd even know the track was there. You can ignore this one and not feel too bad. Where are they now? - With the lack any site to check Wikipedia has some information but that goes back to 2004. In a nutshell from there, Hawley has a had a decent solo career and was nominated for a Mercury Prize. Stafford was in Joe Strummers band for a while and worked with Jarvis Cocker (Pulp). According to his myspace page he went back to school and now does lectures. Hunt sang on a few records and continues to write and record. FDF Personal Comments (aka the Live experience) - I know I have seen the band one time, but the date is a little sketchy. I am pretty sure it was October 24, 1997 opening for Echo and the Bunnymen. The funny part is, I got the set list, I wonder if I wrote the date on that. FDF Overall Take - There are a few great moments on this cd, there really is. Some great Britpop with great sounding drums and guitars. There are a few "ehh" moments as well, but really an pretty fun record if you are in to such a genre. Richard Hawley official and myspace. the mp3's have been removed..